The Club would like to reach 500 followers on Twitter. We are currently at 342. In order to reach 500 we are launching this contest. 2. The new follower will be entered into a draw to win a $200 MavsWear 30th Anniversary Edition credit. The winner of the draw will be able to choose from our selection of MavsWear for the 30th Anniversary for such items as hoodies, sweat pants, jackets etc..
4. You can refer as many new followers as you wish and each time they thank you in the format above you will be entered into the draw. 5. 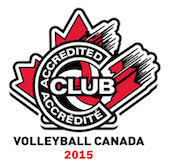 The 500th new follower will receive a $100 gift certificate to any program offered by the Maverick Volleyball Club. This certificate has to be used from September 1, 2014 to August 31, 2015.